Last Monthly Meeting before Annual Exhibition | Canberra Quilters Inc.
Hello Everyone, your friendly Exhibition Coordinator here with a couple of reminders for the August meeting this Thursday. Can you believe it’s just over a week to go before the Exhibition is officially opened? 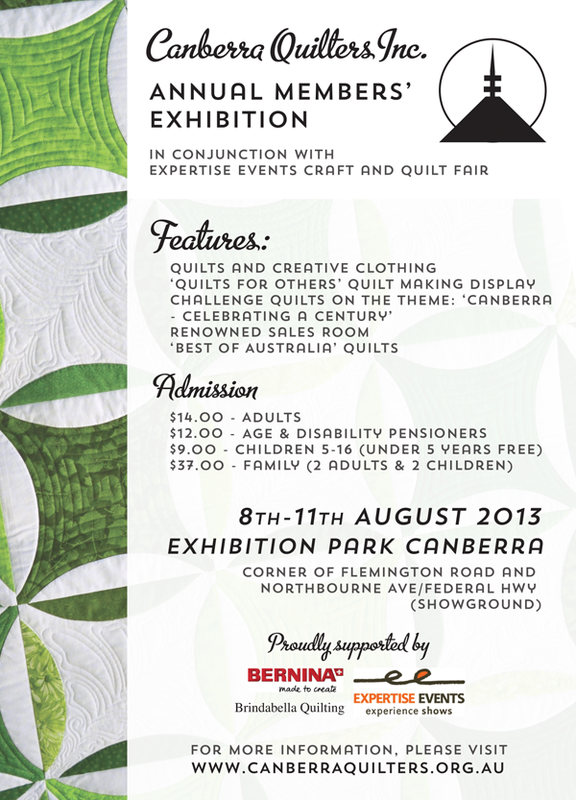 If you’re wanting to get an early bird ticket to the Canberra Quilt and Craft Fair the August meeting will be your last opportunity. You can purchases tickets from myself (Angie Wilson) or Liz Rose. Tickets are $11 (that’s a saving of $3 which is the price of some of those fabulous Fat Quarters that will be available in the trade hall!) and valid for use on any of the 4 days of the Fair. This years Exhibition is shaping up to be a great one. The quilts and creative clothing that has been submitted is so wonderful, varied and sublime that I hope you can all get a chance to see them displayed in all their glory at the Exhibition. If there’s any information you’d like, or anything that I can help with, please feel free to drop me an email (angie[at]gnomeangel.com) and I’ll do my best to help you out. See you all at the August Meeting!! !